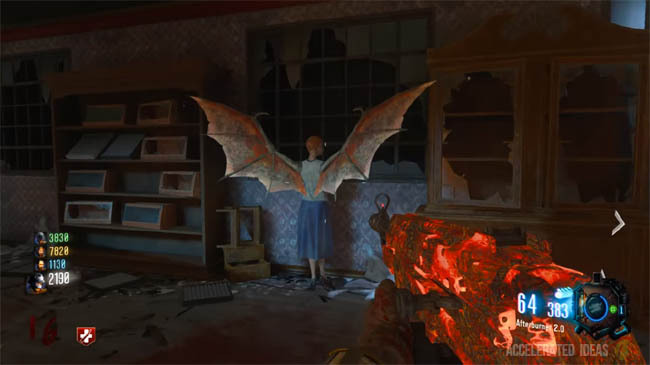 The main Easter Egg for Gorod Krovi is one of the hardest (and most enjoyable) that we've seen in the entirety of Treyarch zombies. There's also a large collection of Side Easter Eggs, with some potentially amazing benefits in Gorod Krovi. In this post I'll guide you through all of these with detailed instructions on each of them. We have a collection of cosmetic items with amazing protection and damage bonuses. Fast travel teleporters, time trial melee weapon rewards, musical easter eggs, mysterious flower vases and many more. 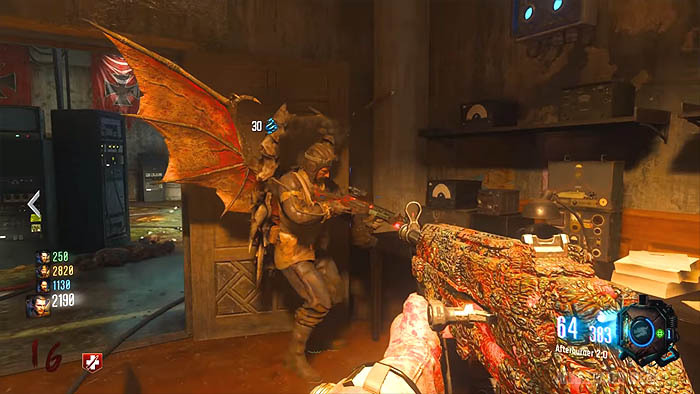 Treyarch have introduced the concept of Time Trials on Gorod Krovi; challenging players to complete a certain number of rounds in an allotted time. The first of these challenges is a the "Round t" challenge which rewards the player with the Wrench melee weapon if they finish round 5 before 5 minutes is up. 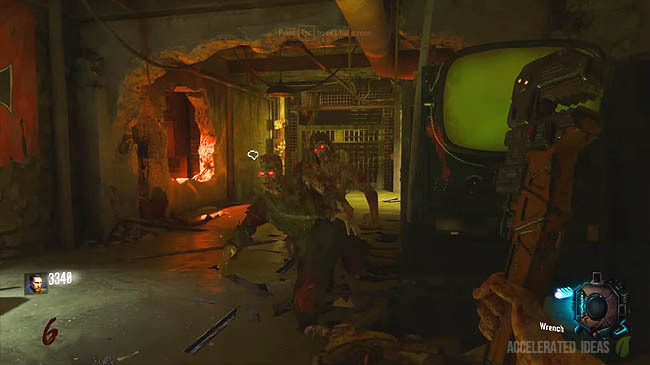 The key to doing this is to stay in the spawn area, killing zombies using the best weapon available and any Gobble Gums to make the job even easier. If you manage to complete the "hidden" challenge a message will appear in screen telling you the Time Trial is complete and that your new weapon is available from the Operations Bunker. So at your next opportune moment, get over to the bunker and claim the weapon from the left hand wall, just before you go inside. The Wrench is a surprisingly strong melee weapon, giving you one hit kills right up until about round 10. Since it's practically free (100 points), it makes a great alternative to the Bowie Knife for maximizing points. I recommend using a Gobble Gum that gives you a Pack-a-Punch weapon straight off the wall and then stay not far from spawn. Apart from providing a great cosmetic change to the player, Dragon Wings offer some great benefits for such little effort. As a starting point the Wings provide 30% explosive damage resistance and 30% fire damage resistance, but best of all they completely do away with the need to watch the dragon flying animation every time you want to go to Pack-a-Punch. To get the wings simply fly a dragon from each of the three launch points (Dragon Command, Supply Depot and War Factory). Then return to the Department Store (1st floor) and pick up the wings from the mannequin. Similar to the Dragon Wings, the Russian Mangler Mask provides players with both a cosmetic change and additional bonus damage: +30% damage to Russian Manglers and 50% damage reduction from Russian Manglers. To get the mask, knock the helmets off several Russian Manglers (5-7 ish), using headshots is the best method. Then when you hear the audio clue, pick up the mask from the mannequin on the 1st floor of the department store (same level as Jug). Available when the drones first appear (Round 10), shoot the the front camera off as many drones as you can. When the audio clue sounds, head over to the coat stand in the department store (next to Jug) to claim the hat. You can ONLY wear either the Mangler Mask or Valkyrie Hat at any time. The hat provides +30% damage to Valkyrie drones, 50% damage reduction from dones and 50% electrical damage reduction. It is again very useful for the Sophia challenges towards the end of the main Easter Egg. Everyone knows that the Dragon Strike tactical weapon is earned by interacting with the crystal machine on the top floor of the Pack-a-Punch building and then surviving a “lockdown” event where hordes of zombies and Russian Mangler’s attempt to storm your position. We now know that the Dragon Strike can also be upgraded - producing an even deadlier version that produces red flame balls. 1. Get around 30 - 50 kills with the Dragon Strike until you get the dragon “roar” audio cue. In spawn area, outside the map to the left of the Quick Revive machine. This one is very hard to see but aim for the crack between the house, beyond the giant sewage pipe which appears to bellow water. Tank Factory, behind where the dragon picks you up. Look slightly to the right where the tank is dangling, then aim just to the left of it. Supply Depot, behind where the dragon picks you up. Stand on the platform and look as far left as you can, next to the building which is an “empty shell” of timber. Dragon Command, on the ground, behind where the dragon picks you up. Look for the three red cross flags and a statue, aim for the ground between the far left flag and the statue. 3. Go back to Pack-a-Punch and interact with the console where you first got the Dragon Strike weapon. 4. Survive another “lockdown” event, (4 rounds) but this time make sure you use the Dragon Strike. 5. Pick up the upgraded Dragon Strike from the console. Wait for the Dragon to breath fire on Dragon Command, War Factory or Supply Depot. Throw a Monkey Bomb into the fire - it will scream. Repeat this process for the remaining two locations. Go to spawn, press square on the doll in the far left hand corner, near the small gravestone (diagonally opposite corner to Quick Revive). Now listen carefully for Samantha’s voice to triangulate the dolls next position; shoot the doll and find the next one. Repeat five times until complete. Some of the possible doll locations are shown below this list. Go back to the same place in spawn, the doll should be spinning. Hold square to claim the Max Ammo and the music will start. Dragon Command - stand outside, face the building and look up to the left side of the roof. It’s on the platform. Dragon Command - inside, high above near the smashed roof hole. To upgrade Monkey Bombs you must first collect all four flower vases and candles shown below. Then get 40 x kills with the Monkey Bombs and pick up the blue canister that drops. Return to the gravestones in spawn (where you get your challenges) and perfectly throw a Monkey Bomb so it sits in-front of the grave. On explosion, the upgraded version should appear for you to pick up. Dragon Command - Left hand room as you go up the stairs. It’s on the desk by the telephone. Supply Depot - downstairs, near the outside entrance on top of the desk with the clipboard. Supply Depot - upstairs, on the desk by the telephone just as you come out of the train carriage. Department Store - same floor as Jug, check the white table with the lantern on top, near the wall gun. Similar to the Flower Vases, there are four Candles on the map and each player can only see one of them (if not playing SOLO). To pick up a Candle - light it with the shields fire attack first. Supply Depot - ground floor of Supply Depot, wooden table to the left of Gobble Gum machine. Infirmary - middle floor, on the bunkbed to the left of where you sometimes find the shield part. Department Store - same floor as Jug, next to the cash register (till) which is to the right of the stairs leading up. Tank Factory - left of Double Tap on the desk. On the couch just inside the door of the Department Store from spawn. You walk straight past it on your way to the stairs. Go past Jug, downstairs towards the Operations Bunker. Outside the entrance there are two bodies by the truck. The bottle is in between them. Inside the Supply Depot on the ground floor. On your way out of the room near the yellow control panel, check the shelf with the box that has a cross on it. In the War Factory, to the left hand side of Double Tap on the chalkboard. In Dragon Command. Head up the stairs, take a left into the room with the wall weapon. Check the desk with the telephone for the next card. Go to Pack-a-Punch, check the room on the right hand side of the PaP machine. The card is wedged between two books on the desk by the radio.